The resilient Queen Palm tree is Native to South America, primarily from Brazil to the Argentina. Queen Palms are easily found in many landscapes throughout Florida and California. Although not a native to North America, it has found a home in tropical to sub-tropical areas. The Queen Palm tree is also cold hardy during times of winter months and has also been seen withstanding snowfall. It is characterized by its white-pale trunk and ever-green feathery leaves. The Queen Palm tree is used in most subtropical landscapes because of the cost and the quick growth of the palm tree. The Queen Palm tree is seen in groupings as well as solitary. The pinnate leaves of the Queen Palm tree are feathery with an ever-green color. The stem of the leaf can be 5 to 15 ft long with each leaflet blade approximately 18 to 36 inches long. The trunk of the Queen Palm tree is pale-white with noticeable rings where the leaves have fallen off. 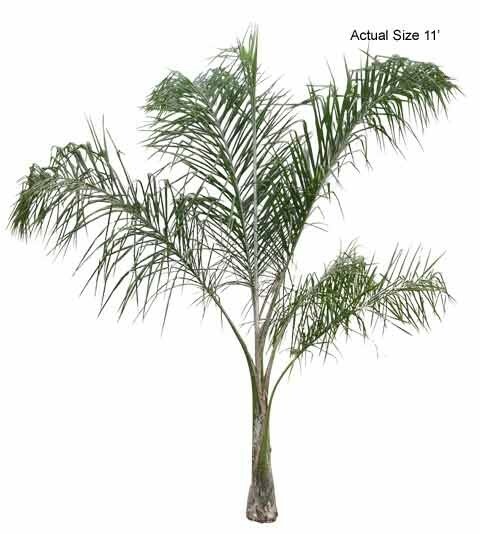 The Queen Palm tree is a great for curb appeal and can be placed in unique groupings to create a serene landscape. Large palm trees start from 9' and measured from soil to top of fronds, unless noted as CT which is measured from soil to top of trunk. You can select your exact size on the drop down menu, labeled Palm Tree Size. What is your favorite palm tree? All Rights Reserved. RealPalmTrees.com - The Palm Tree Store logo is a registered trademark. This website and material contained herein, may not be copied, reproduced, rewritten, or distributed.